Thanks to a reader’s suggestion, I took another look at the profit and market share data from the mobile phone market overview posted last quarter. 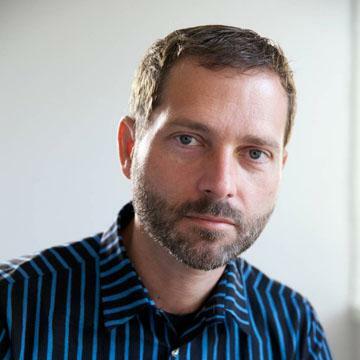 This time to compare the vendors on two dimensions at the same time. I chose to label the quadrants to indicate the possible categorization of the companies. It’s interesting to note the shift over the time period of the eight vendors. 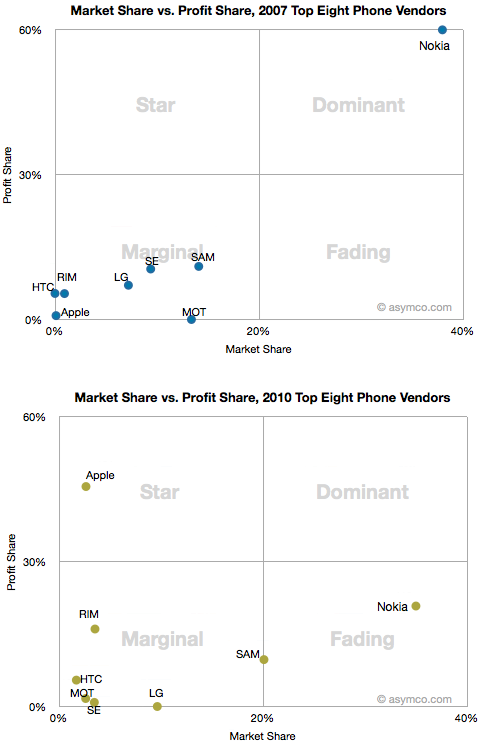 Whereas Nokia moved from Dominant to Fading, only Apple rose from Marginal to Star. 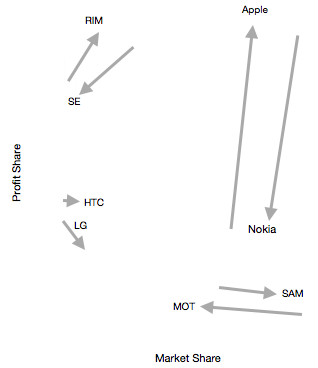 The Marginal players dispersed their placement with Samsung moving laterally toward Nokia while RIM followed in the Apple trajectory and increased profit share while maintaining relatively low share. Thinking about motion around these two dimensions could be reduced to a vector model. If each vendor is represented by an arrow showing direction and distance moved, we can compare each vendor vs. a symmetric competitor which might account for the loss or gain of share. Although the data does not contain all market participants, the shifts in share are quite closely conserved with the vector magnitude (arrow length) and angle (direction) paired. Note how Nokia and Apple swapped Profit without too much impact in Units volume. Similarly, RIM and Sony Ericsson traded profits and volumes quite symmetrically. Samsung also took volume while Motorola lost it. 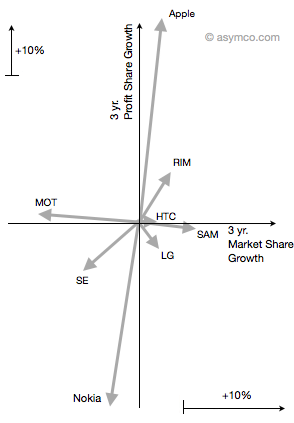 HTC and LG did not change positions dramatically. It becomes quite easy to see who the winners and losers are and by how much. This model is only an observation of the shifts in market power and is not conclusive about where share was gained or lost, however there is compelling symmetry which also matches the intuition of observers.